Turkish security forces seized an ancient Torah with a leather cover gilded with gold, along with various ancient coins in anti-smuggling operations across the country Friday. The Torah was seized by Provincial Gendarmerie Units and the Anti-Smuggling Branch in central-western Turkey's Afyonkarahisar in an operation conducted in Bolvadin district. Four suspects were also detained in connection with the smuggled item. In a similar operation, gendarmerie and anti-smuggling units in central Tokat province confiscated nine ancient coins in a raid on a house in Erbaa district. Some 11 suspects were detained but later released by court. The ancient items were later delivered to the directorate of museums in Tokat. In a separate operation in capital Ankara, the gendarmerie units busted a suspect who was about to sell a trove of ancient items. Disguising themselves as potential customers, gendarmerie units met with the suspect identified as M.C.G. in a store in Göztepe neighborhood. 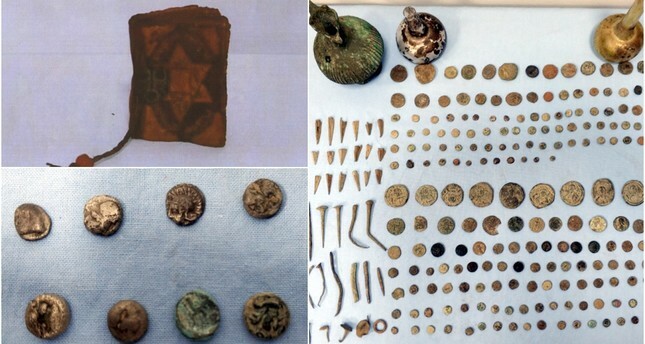 Some 109 ancient coins and 11 other ancient objects were found on the suspect, and seized by security units. Thousands of anti-smuggling operations are carried out across Turkey every year to halt the illegal sale of historical objects and protect the country's rich cultural heritage. The issue is crucial to a country that is home to about 3,000 ancient cities from 42 civilizations and whose tourism industry relies on its rich historical heritage to attract millions of foreign visitors each year.